The Parental Controls function can be used to control the internet activities of the child, limit the child to access internet and restrict the time of surfing. 2. Under Advanced configuration, go to Network Control→Parental Controls, and then you can configure the parental controls in the screen. 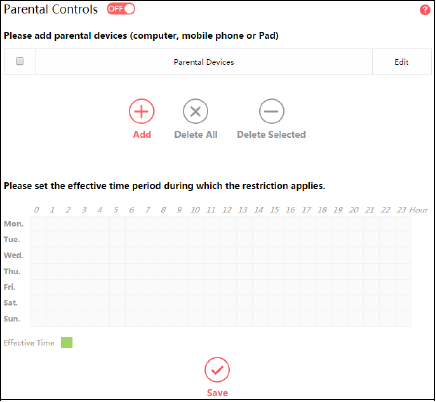 Parental Controls – Click to enable or disable this function. Parental Devices – Displays the MAC address of the controlling PC. Edit - Here you can edit an existing entry. Add - Click to add a new device. Delete All - Click to delete all devices in the table. Delete Selected - Click to delete selected devices in the table. Effective Time - All devices except the parental devices will be restricted. Click and drag across the cells to set the restriction time periods. To add a new entry, follow the steps below. 2. Select a device from the drop-down list. To set the effective time, follow the steps below. 1. Click and drag across the cells to set the restriction time periods.